BEIJING (Reuters) – China is likely to use its vast currency reserves to stop any precipitous fall through the psychologically important level of 7 yuan per dollar as it could risk triggering speculation and heavy capital outflows, policy insiders said. 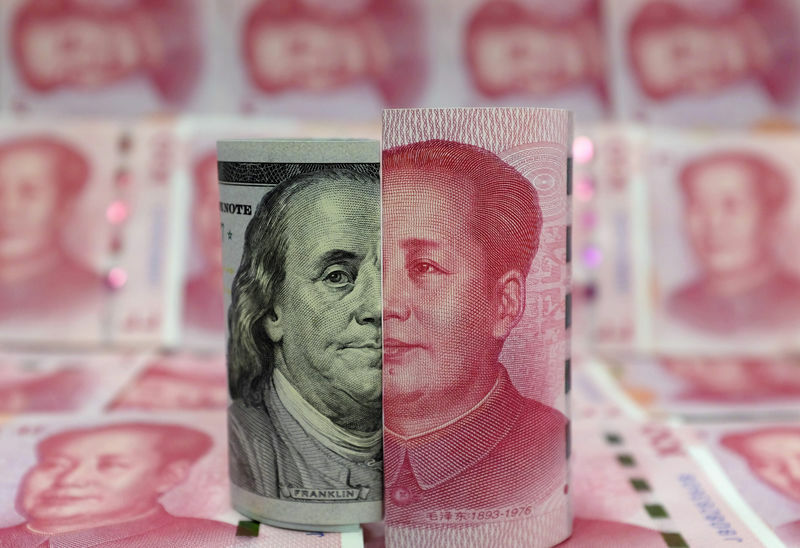 On Friday, the yuan yuan hit a fresh 22-month low of 6.9647 against the dollar, and traders expected that the tightly managed, partially convertible currency would soon be testing 7 per dollar, a level unseen since the global financial crisis a decade ago. The yuan has lost over 6 percent versus the dollar so far this year, partly reflecting its slowing economy and pressure on exports due to an ongoing tariff war with the United States. Two sources involved in internal policy discussions, but who are not the final decision-makers, said that a defence of the yuan at 7 per dollar would be mounted to show investors that the authorities wouldn’t allow a runaway market. The second source was certain the central bank would make a stand, rather than allow any sudden break through a psychologically important level to feed pessimism among investors. “The central bank will intervene – intervene directly or indirectly. It’s necessary. The central bank has many policy tools. We cannot let the yuan fall past 7, as it would have a psychological impact on people,” the second source said. Beijing’s priority now is to ward off a sharper slowdown in the economy, which grew 6.5 percent in the third-quarter, the weakest pace since the global financial crisis, several sources said. The central bank, which has cut reserve requirements for lenders four times this year, is expected to ease monetary policy further, while on the fiscal side the government has pledged more tax cuts next year to support growth. The People’s Bank of China will probably loosen monetary policy further and let the yuan lose more ground to bolster sagging economic growth, but policymakers will be on guard against spooking markets as the exchange rate nears 7 per dollar, a third source said. “We need to loosen monetary policy and should allow the yuan to depreciate to help expand exports, otherwise it will be more difficult,” the source said. The PBOC did not immediately respond to Reuters’ request for comment, but Vice Governor Pan Gongsheng told a briefing earlier that healthy economic fundamentals and ample foreign currency reserves would help keep the yuan basically stable. Currency market participants are closely watching to see if China’s foreign currency reserves fall below $3 trillion, having slipped to $3.087 trillion last month. Reserves fell $52.9 billion in the first nine months of 2018 – with 43 percent of the drawdown happening in September, but the scale of the decline is dwarfed by a record annual drop of $512.7 billion in 2015, showing the authorities have been far less interventionist. Pan said the central bank would adopt macro-prudential measures to stabilise market expectations, warning against speculators who seek to drive the yuan weaker. Earlier this month, authorities restricted outward investment by its residents earlier this month. Capital outflows have picked up as the yuan moves closer to the key 7 per dollar level. Net foreign exchanges sales by China’s commercial banks rose to $17.6 billion in September, the highest in 15 months. So far this year, Chinese policymakers have been less interventionist on the yuan than they were in 2015, as a weaker currency helps cushion a slowing economy and take some of the sting out of higher U.S. tariffs, although Beijing has rejected talk that it’s deliberately pushing down the yuan to spur exports. Pan reiterated that the PBOC rejected the use of competitive currency devaluation as an answer to the trade pressures arising from the tariff war.